Sherman Garner, funding analyst; Neil Schloss, treasurer and VP; Mike Bishay, funding analyst; Susan Thomas, associate general counsel, Ford Motor Credit; David Webb, director, financial strategy; and Scott Krohn, director, long-term funding and securitization. Jud Kelley, senior counsel, not pictured. 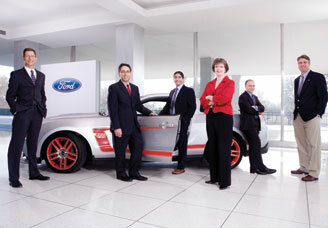 As part of Ford Motor Co.’s drive to regain an investment-grade credit rating, Ford Motor Credit created a new type of security. The Ford Upgrade Exchange Linked (FUEL) notes bridge the gaps between asset-backed and unsecured debt and between the non-investment grade and investment-grade markets. The notes were designed to smooth the way for a rating upgrade and also served to reintroduce Ford to investment-grade investors.